YOU DON’T HAVE TO KNOW all the elements of a story to tell it visually. Yes, photography certainly has the technical means to tell a detailed tale, but that narrative need not be spelled out in every particular by the camera. Indeed, it might be the very information that’s “missing” that may be the most compelling element of a visual story. That is to say, if you don’t know all the facts, make the picture. And if you do have all the facts, maybe leave out a few…. and make the picture anyway. The above image illustrates this strange mis-match between storytelling and story material. As a shooter, I’m tantalizingly close to the couple at the table next door to me at a plaza restaurant. I mean, I can practically count the salt grains on the lady’s salad. I can also tell, by her male companion’s hand gestures, that a lively conversation is underway. But that is the sum total of what I know. I can’t characterize the discussion. A business planner? A lover’s quarrel? Closing the sale? Sharing some gossip? Completely unknown. Sure, I could strain to pick up a word here or there, but that alone may not be enough to provide any additional context, and, in fact, I don’t need that information to make a picture. This is what I call “low info, high narrative”, because I don’t require all the facts of this scene to sell the message of the picture, which is conversation. As a matter of fact, my having to leave out part of the image’s backstory might actually broaden the appeal of the final product, since the viewer is now partnering with me to provide his/her version of what that story might be. It’s like my suggesting the face of a witch. By merely using words like ugly or horrible, I’ve placed you in charge of the “look” of the witch. You’ve provided a vital part of the picture. You won’t always have the luxury of knowing everything about what you’re photographing. And, thankfully, it doesn’t really matter a damn. That’s why we call this process making a picture. We aren’t merely passive recorders, but active, interpretive storytellers. High narrative beats low info every time. Yestertoys (2017). Making this image look merely “real” held no interest, so…..
MEMORY ISN’T SHARPLY DEFINED OR TIDY, and so the act of conjuring remembrance in art is never as forensically factual as sliding open an autopsy drawer. The yester-thing that we treasure most dearly are the true opposite of clinical artifacts: they are, instead, bleary, distorted, indistinct, and mysterious. Small wonder that trying to fix memory on a camera sensor is like trying to pitchfork smoke. Creating images in an attempt to capture the past is a huge part of photography, but it’s a no-man’s land without clear markings or signs. We begin our visual argument by asserting that our version of a memory is the official one… but official according to whom? Even people who have shared a specific event will offer different testimony of what it “really” was. And that very subjective uncertainty becomes one of photography’s greatest charms. It only took a few years for early shooters to conclude that photographs need not be confined to merely measuring or documenting the world. Early on, they enlisted fancy and whimsy to the cause of depicting memory, just as painters did. And conversely, once there was a machine like the camera to perform the task of faithfully recording “reality”, painters began to abandon it for Impressionism and everything that followed after. Both arts began, like Alice, to regularly venture out on both sides of the looking glass. A great part of photography’s allure is in discovering how little objective reality has to be in image involving memory, and what an adventure it is to escape the actual in the pursuit of the potential. The camera lets us tell lovely lies in pursuit of the truth. A simple manipulation of single–source light produces a wide range of effects. THE SELF–EDUCATION PROCESS INHERENT in photography is perpetual: that is, the lesson-learning doesn’t “clock out” merely because a given task is completed, but flows equally during the in-between moments, the spaces outside of,or adjacent to, the big ideas and big projects. Down time need not be wasted time. Often it’s because the pressure of delivering on a deadline is absent that we relax into a more open frame of mind as regards experimentation. You find something because you’re not looking for it. One such area for me is lighting. I seldom use flash or formal studio lights, so I obsess over cheap, mobile, and flexible means of either maximizing natural light or adding artificial illumination in some simple fashion. This isn’t just about making an object seem plausibly lit, or, if you like, “real: it’s also about choosing or sculpting lighting schemes, making something look like I want it to. Small, powerful LEDs have really given me the chance to fill spare moments cranking out a wide array of experimental shots in a limited space with little or no prep, producing shaping light from every conceivable angle. I just lock the camera down on a tripod, make some simple arrangement on a table top, and shoot dozens of frames with different directional sweeps of the light, usually over the space of a time exposure of around a half a minute. I can move the light in any pattern, either by holding it static or tracking high/low, left/right, etc. Frequently this activity does not result in a so-called “keeper” image. Such spare-time experiments are about process, not product. The real pay-off comes somewhere further down the road, when you have need of a skill that you developed over several days when you had.. nothing to do. WHETHER THERE IS CONSENSUS ABOUT THE PRESENT OR FUTURE STATE OF THE NATURAL WORLD, we are certainly in the midst of the most muscular conversation about its fate than many of us have ever known. That means that we are changing and challenging our relationship to the globe almost daily…and, along with that relationship, the way that we see, and visually report upon it. That generates a new emphasis on bearing witness to what the planet is/can be/ might be. I call it the new era of testimony. The birth of photography coincided with the first great surge of cross-continental expansion in America, as well as an explosion in invention and mechanization. The new system for making a physical record of the world was immediately placed into service to help quantify the scope of the nation…to measure its mountains, track its rivers, count its standing armies. Photographers like Timothy Sullivan and William Henry Jackson lugged their cameras east-to-west alongside geological surveys, railroad agents, and the emerging naturalist movement. While some shooters chose to capture the creation of new trestle bridges, others helped poets illustrate their Walden-esque reveries. In all cases, photography was tasked with the job of showing the natural world and our interaction with it. Most importantly, the images that survive those times are a visual seismograph on both the grand and grotesque choices we made. They are testimony. And now is a time of radical re-evaluation of what that interaction should look like. That means that there is a visual story to tell, one of the most compelling and vital that photography has ever told. Regardless of your personal stances or stats, man’s place on the planet will be in a state of fundamental shift over the coming decades. And the images that this change generates will define both photography as an art and ourselves as stewards of an increasingly fragile ecology. Ansel Adams, for all his gorgeously orchestrated vistas, was, I believe, mistaken in almost deliberately subtracting people from his grand scenes, as if they were irrelevant smudges on nature’s work. It doesn’t have to be that way. We need not make war on our native world. But whatever we do, we need to use the camera to mark the roads down which we have chosen to walk. Whether chronicling wise or foolish decisions, the photograph must be used to testify, to either glorify or condemn our choices going forward. 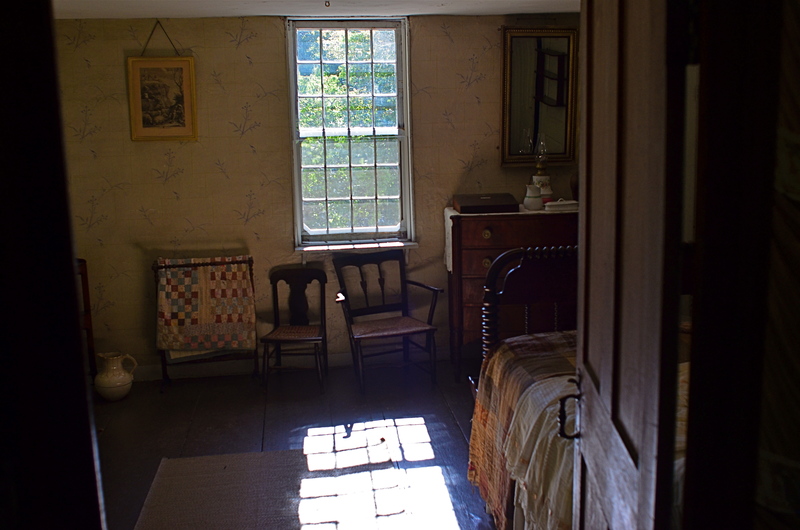 A sunlit bedroom at the Old Manse, the farm home built for the grandfather of Ralph Waldo Emerson. THERE CAN BE NO BETTER DEMONSTRATION OF THE HUMAN RACE’S TWO CONFLICTING APPROACHES TO EXISTENCE than are on display in the peaceful town of Concord, Massachusetts, where one of the most renowned jumping-off sites for war and destruction sits cheek-by-jowl with one of the quietest monuments to the serenity of the mind. It’s a contrast which no photographer should fail to experience. Just a few hundred yards from the tiny footbridge which is rumored to have launched the American Revolution is a carefully preserved haven known as the Old Manse, a modest two-story country home built in 1770 for patriot minister William Emerson. The home came, eventually, to temporarily host a trio of the young nation’s most eloquent voices: Nathaniel Hawthorne, Henry David Thoreau, and Ralph Waldo Emerson (the good minister’s grand-son). The house remained in the hands of the extended Emerson family until as late as 1939, when it was conveyed to the state’s Trustee of Reservations. Over the years, the Manse helped incubate the energies that produced Emerson’s Nature, Hawthorne’s Mosses From An Old Manse, and various love poems written between Thoreau and his wife. The house also retains writing desks used by Hawthorne and Emerson. 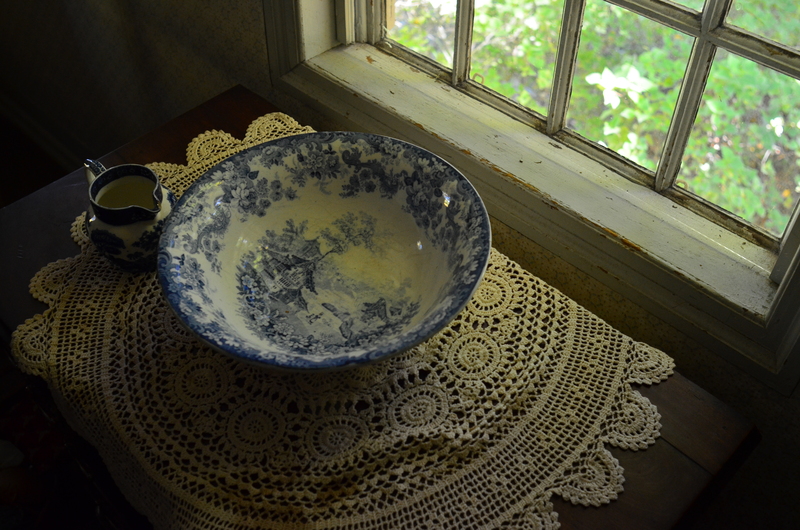 Over 90% of the Manse’s original furnishings from the 18th century have been preserved. The manse supports itself, its side garden and its replica corn field with a modest bookstore and daily walking tours of the house’s rooms, which are said to feature nearly 90% of the structure’s original furnishings. However, as is the case with Annie Liebowitz’ profound essay on the living spaces of quintessential Americans, Pilgrimage, the effect of the house on the photographer’s eye can never only be in the arrangement of physical artifacts. There is something more ethereal going on than merely snapping The Place Where He Sat And Wrote, an unfilled space that exists between these mere things and the essence of those transcendent writers. And while I’m not sentimental enough to believe that you can render a person just by photographing an object from his desk, there is something that lingers, however impossible it is to quantify. Revolutions are very amorphous things. Some come delivered by musket ball. 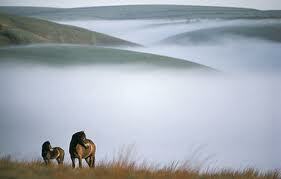 Others arrive in wisps of quietude, seeping into the soul with the stealth of smoke. The Old Manse launched its own crop of “shots heard ’round the world”, the echoes of which can sometimes resound in the echo of an image. It’s a lucky thing to be ready when the message comes. 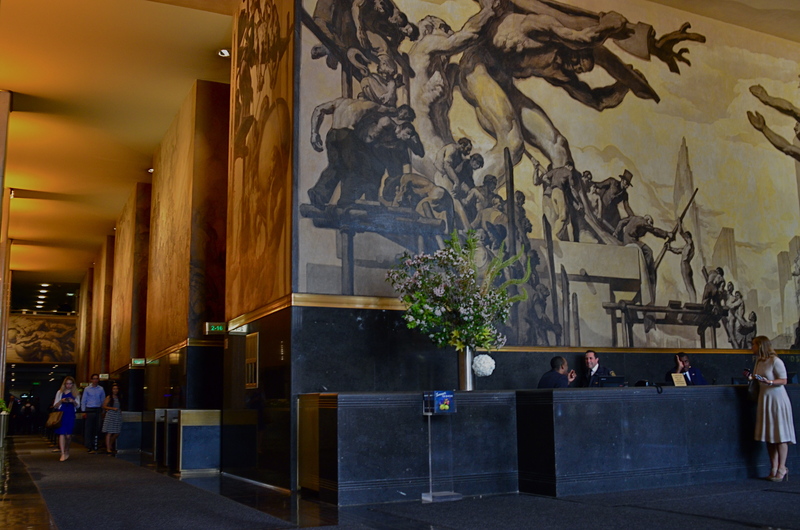 Part of Jose Maria Sert’s soaring mural American Progress (1937) above the main information desk just inside the entrance to 30 Rockefeller Plaza. 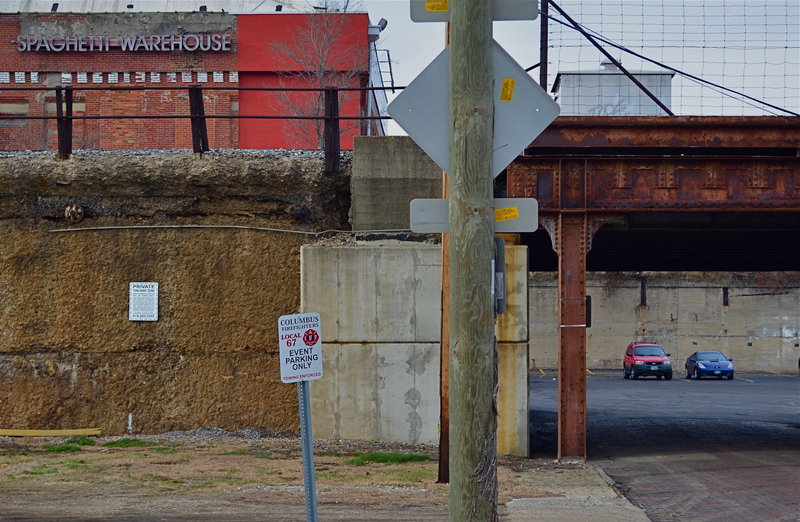 THE EROSION AND COLLAPSE OF THE GREAT AMERICAN URBAN INFRASTRUCTURES of the 20th century is more than bad policy. It is more than reckless. It is also, to my mind, a sin against hope. As photographers, we are witness to this horrific betrayal of the best of the human spirit. 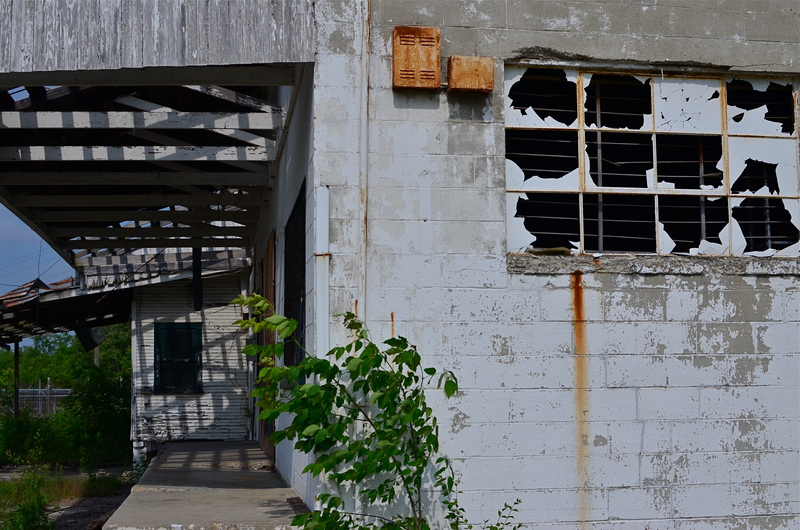 The pictures that result from this neglect may, indeed, be amazing. But we capture them with a mixture of sadness and rage. Hope was a rarity in the early days of the Great Depression. Prosperity was not quite, as the experts claimed, “right around the corner.” And yet, a strategy arose, in private and federal project alike, that offered uplift and utility at the same time. People were put to work making things that other people needed. The nation erected parks, monuments, utilities, forests, and travel systems that turned misery to muscle and muscle to miracle. Millionaires used their personal fortunes to create temples of commerce and towers of achievement, hiring more men to turn more shovels. Hope became good business. One of the gleaming jewels of the era was, and is, the still-amazing Rockefeller Plaza in New York, which, in its decorative murals and reliefs, lionized the working man even as it put bread on his table. The dignity of labor was reflected across the country in everything from newspaper lobbies to post office portals, giving photographers the chance to chronicle both decline and recovery in a country brought only briefly to its knees. Today, the information desk at 30 Rockefeller Plaza, home of NBC studios, still provides a soaring tribute to the iron workers and sandhogs who made it possible for America to again put one foot in front of the other, marching, not crawling, back into the sunlight. 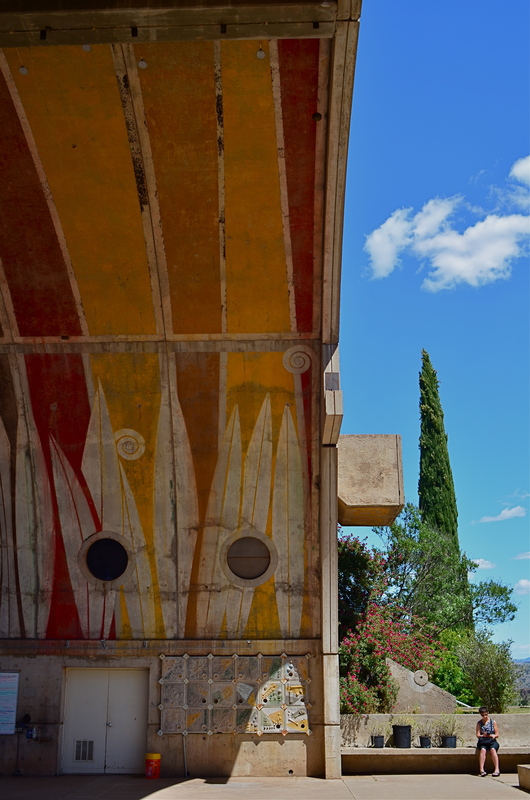 It still makes a pretty picture, as can thousands of such surviving works across the country. Photographing them in the current context of priceless inheritance offers a new way to thank the bygone architects of hope. This hulk was once someone’s idea of progress and prosperity. IF ARCHITECTURAL PROJECTS, AT THEIR BIRTHS, REPRESENT A KIND OF FAITH, then the demise of buildings likewise signals a sort of death, a loss of belief, an admission of failure. Our new societies break ground on developments in one generation only to see them wither to silence in the next, a cycle of boom and bust that somehow has become the rhythm of modern life. Viewing the ruins that result from all our once-bright industrial dreams through the lens of a camera creates a peculiar kind of commentary, less specific but more emotionally immediate than a written editorial or essay. The first uses of photography as chronicles of urban life were largely neutral, merely recording city vistas, monuments, cathedrals, scenic wonders. It took the aftermath of World War One and the Great Depression to infuse architectural photos with the sting of commentary, as if the photographer was asking, what have we done? What is all this for? In the 1930’s, there was a quick segue from the New Deal’s programs for documenting relief programs to a new breed of socially activist shooters like Walker Evans and Margaret Bourke-White, who showed us both the human and architectural faces of despair. Suddenly closed businesses, shabby tenements, and collapsed infrastructures became testimony on what we were doing wrong, of the horrific gap between our dreams and our deeds. In every town across America, photographers continue to search for the headstones of our lost hopes, the factories, foundries, and dashed ventures that define who we hoped to be, and how things went wrong. It’s not a photography of hopelessness, however, but a dutiful reminder that actions have consequences, for good or ill. Turning our eyes, and lenses, to the stories left behind by the earlier versions of ourselves is a way of measuring, of keeping score on what kind of world we desire. The headstones bear clear inscriptions. Deciphering them is the soul of photography. 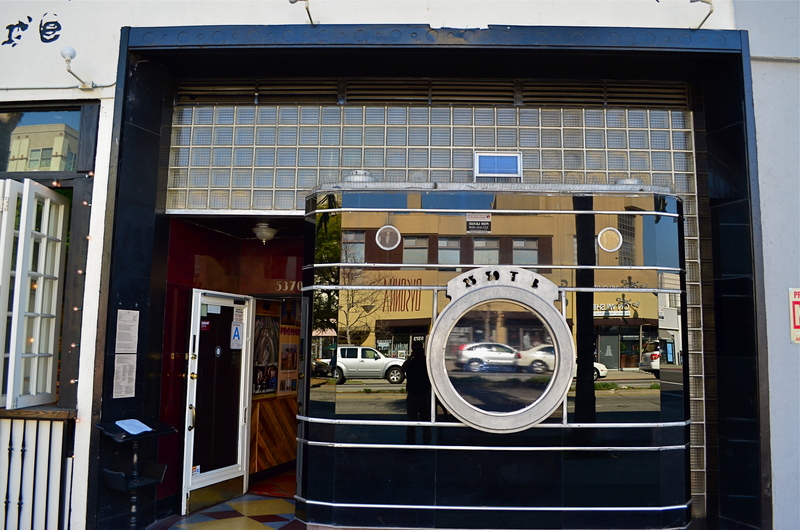 The remaining facade from Los Angeles’ historic Darkroom camera shop at 5370 Wilshire Boulevard. THERE IS A PART OF WILSHIRE BOULEVARD IN LOS ANGELES that I have been using for a photographic hunting ground for over ten years, mostly on foot, and always in search of the numerous Art Deco remnants that remain in the details of doors, window framings, neighborhood theatres and public art. Over the years, I have made what I consider to be a pretty thorough search of the stretch between Fairfax and LaBrea for the pieces of that streamlined era between the world wars, and so it was pretty stunning to realize that I had been repeatedly walking within mere feet of one of the grand icons of that time, busily looking to photograph….well, almost anything else. The Darkroom in its Kodachrome days. A few days ago, I was sizing up a couple framed in the open window of a street cafe when my composition caught just a glimpse of black glass, ribbed by horizontal chrome bands. It took me several ??!? !-type minutes to realize that what I had accidentally included in the frame was the left edge of the most celebrated camera in all of Los Angeles. 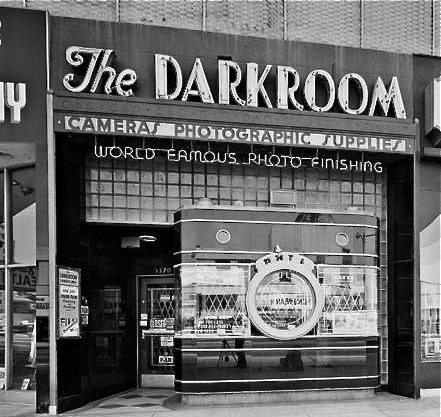 Opened in the 1930’s, the Darkroom camera shop stood for decades at 5370 Wilshire as one of the greatest examples of “programmatic architecture”, that cartoony movement that created businesses that incorporated their main product into the very structure of their shops, from the Brown Derby restaurant to the Donut Hole to, well, a camera store with a nine-foot tall recreation of an Argus camera as its front facade. The surface of the camera is made of the bygone process known as Vitrolite, a shiny, black, opaque mix of vitreous marble and glass, which reflects the myriad colors of Los Angeles street life just as vividly today as it did during the New Deal. 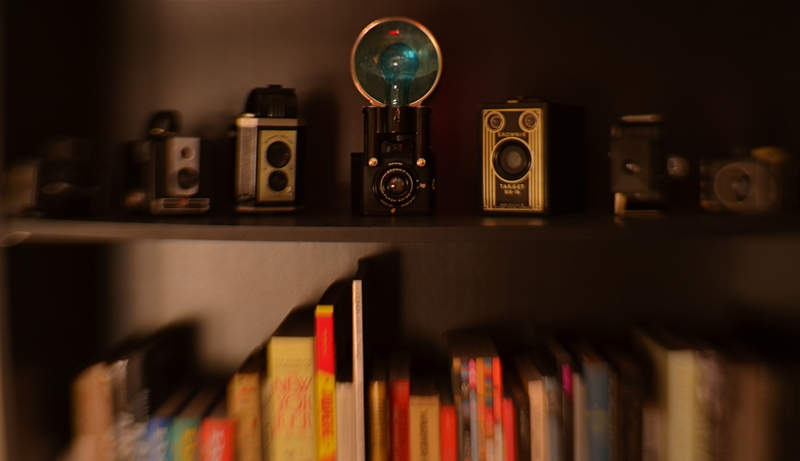 The shop’s central window is still the lens of the camera, marked for the shutter speeds of 1/25th and 1/50th of a second, as well as T (time exposure) and B (bulb). A “picture frame” viewfinder and two film transit knobs adorn the top of the camera, which is lodged in a wall of glass block. Over the years, the store’s original sign was removed, and now resides at the Museum of Neon Art in Glendale, California, while the innards of the shop became a series of restaurants with exotic names like Sher-e-Punjab Cuisine and La Boca del Conga Room. Life goes on. True to the ethos of L.A. fakes, fakes of fakes, and recreations of fake fakes, the faux camera of The Darkroom has been reproduced in Disney theme parks in Paris and Orlando, serving as…what else?….a camera shop for visiting tourists, while the remnants of the original storefront enjoy protection as a Los Angeles historic cultural monument. And, while my finding this little treasure was not quite the discovery of the Holy Grail, it certainly was like finding the production assistant to the stunt double for the stand-in for the Holy Grail. 3-D PHOTOGRAPHY SEEMS DOOMED TO FOREVER RESIDE ON THE PERIPHERY OF THE MEDIUM AT LARGE, a part of the art that is regarded with mild derision, a card trick, a circus illusion. My own experience in it, from simple stereoscopic point-and-shoots to high-end pro-sumer devices like the Realist or View-Master cameras, has met with a lot of frustration at the unavoidable technical barriers that keep it from being a truly sharable kind of photography. It’s rife with specialized viewers, odd goggles, and cumbrous projection systems. It calls attention to effect to the detriment of content. It is the performing seal of photography. That said, the learning curve needed to compose for stereo effect is equally valuable for overall “flat” composition, since you must always be mindful of building layers of information from front to back, the better to draw your viewer’s eye deep into your subject. Some will meet this challenge with a simple selective depth of field, as if to say: only pay attention to the stuff that is sharp. The front/back/sides don’t matter…I’ll tell you where to look. Others decide to arrange the front-to-back space all in the same focus, forcing the eye to travel in a straight line. Depends on what you need to say. DSLRs allow you to elect for the former strategy, while iPhone photography, at least at this point in history, pretty much forces you to adopt the latter. You just don’t have the fine control needed for selective focus in a smartphone, any more than you have a choice shutter speed or how wide you shoot. With few exceptions, the iPhone and its cousins are marvelously adroit point-and-shoots, so your composition options lie chiefly in how you frame things up. Quickly. This “think fast” mentality works to your benefit in the stealthier parts of street photography. The quicker you click, the harder it is to be detected, which means fewer “hey, what are you doing” issues with reluctant subjects. Even so, you have to be composing consciously if you want to establish a strong line to maximize the illusion of depth. It means deciding where the main drama in a shot resides and composing in reference to it. In the above shot, the woman lost in her John Updike novel is the main interest, but the steep diagonal of the wall leads you to her, then, as a second stage, to the lighter pair of friends in back. Framed in this manner, depth can be accentuated. There are happy accidents and there are random luck-outs in photography, to be sure, but to create a particular sensation in your pictures, you must craft them. In advance. On purpose. PHOTOGRAPHY WAS IN ITS INFANCY WHEN IT WAS FIRST PRESSED INTO SERVICE as a reportorial tool, a way of bearing witness to wars, disasters, and the passing parade of human folly and fashion. Since that time, at least a part of its role has been as a means of editorial commentary, a light shone on crisis, crime, or social ills. The great urban reformer Jacob Riis used it to chronicle the horrific gulf between poor and rich in the legendary photo essay How The Other Half Lives. Arthur Rothstein, Dorothea Lange and Lewis Hine, among many others, turned their cameras on the desperate need and changing landscape of America’s Great Depression. And now is the time for another great awakening in photography. It’s time to show where our cities need to go next. America’s infrastructure is at a crossroads. And that means that photographers are, as well. Politics aside, the rotting state of our urban infrastructures is an emergency crying out for the visual testimony that photographers brought so eloquently to bear on poverty and war in ages past. The magnifying glass needs to be turned on the neglect that is rapidly turning America’s urban glory into rust and ruin. And no one can tell this story better than the camera. We can fine-tune all the arguments about how to act, what to fund, and how to proceed. That’s all open to interpretation and policy. But the camera reveals the truths that are beyond abstraction and opinion. The underpinnings of one of the world’s great nations are rapidly dissolving into exposed rebar and pie-crust pavement. If part of photography’s mission is to report the news, then the decline of our infrastructure is one of the most neglected stories in the world’s visual portfolio. Photographers can entice the mind into action, and have done so for nearly two centuries. They have peeled back the protective cover of politeness to reveal mankind at its worst, and things have changed because of it. Agencies have been formed. Action has been accelerated. Lives have been changed. Jobs have been created. It didn’t used to be an “extra credit” question on the exam of life just to maintain what amazing things we have. Photographers are citizens, and citizens move the world. Not political parties. Not kings or emperors. History is created from the ground up, and the camera is one of the most potent storytelling tools used in shaping that history. The story of why our world is being allowed to disintegrate is one well worth telling. Capturing it in our boxes just might be a way to shake up the conversation. Try the special. 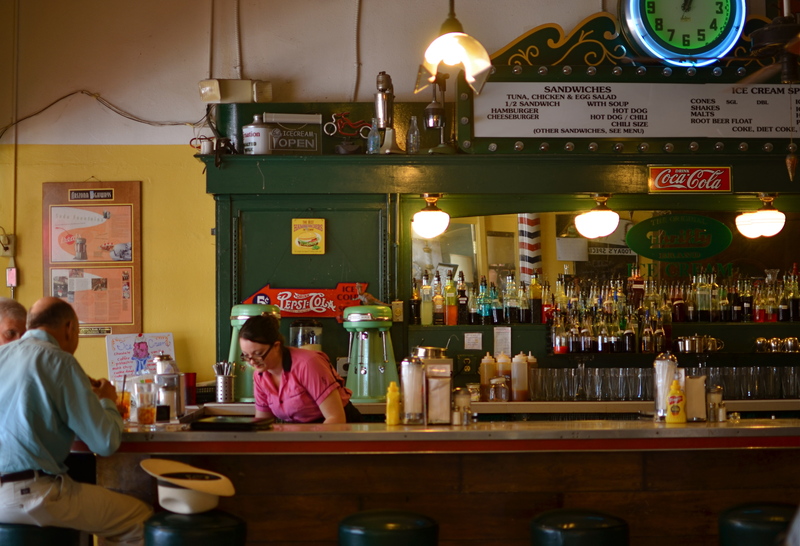 Heck, it’s all special at the lunch counter at McAlpine’s Soda Fountain in Phoenix. 1/100 sec., f/1.8, ISO 100 35mm. BETTER MINDS THAN MINE HAVE LAMENTED THE HOMOGENIZING OF URBAN LIFE, that process by which uniqueness is gradually engineered out of human experience in buildings, businesses and products, to be replaced by the standardized, the research-proven, the chain-generated. We all say we hate it. And we all put the lie to that statement by making the super-brands, all those golden arches and whole food superstores, more and more fabulously wealthy. As a photographer, I feel a particular pang for the ongoing vanishing act that occurs in our cities. Who wants to aspire to take more and more pictures of less and less? Is a Starbucks in Kansas City really going to give me a profoundly different experience than a Starbucks in Jackson Mississippi? How, through creative location of the mug racks? And here, in the name of honesty, I have to catch myself in my own trap, since I also often default to something “safe” over something “unproven”. That is, I am as full of it as everyone else, and every day that I don’t choose to patronize someplace special is a day that such places come closer to the edge of the drain. It’s a delight to go someplace where fashion, and relevance, and context have all been rendered moot by time. Where, finally, just the fact that you have lasted this long means you can probably do so indefinitely. 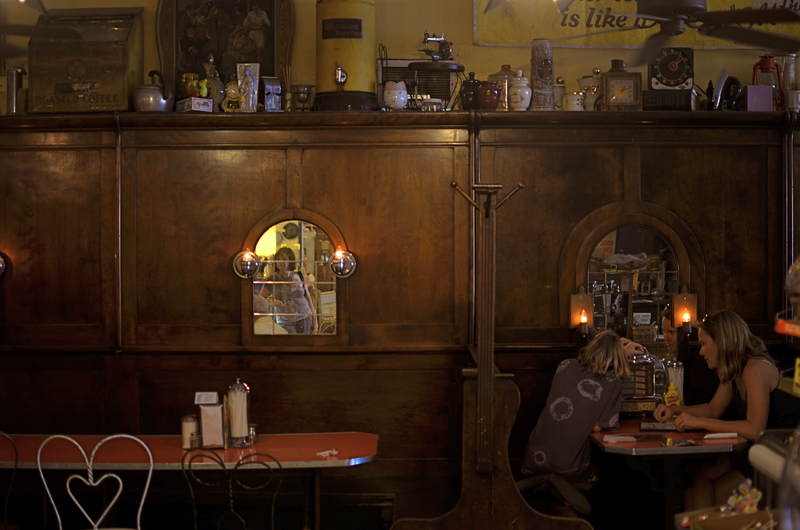 Such a place is McAlpine’s Soda Fountain Restaurant in central Phoenix. Birthed in 1926, the place was itself a part of America’s first huge surge of chain stores, originally housing a Rexall Pharmacy but centered around its fountain counter. The fare was, and remains, simple. No pondering over trans fats, no obsessing over sugar, no hair-raising tales of gluten reactions. Gourmet means you take your burger with both ketchup and mustard. “Soda” implies not mere fizzy water but something with a huge glob of ice cream in it. Thus your “drink” may also be your dessert, or you can just skip the meal pretense altogether and head right for the maraschino cherries. McAlpine’s is a place where the woods of the booths are dark, and the materials of general choice are chrome, marble, neon, glass. 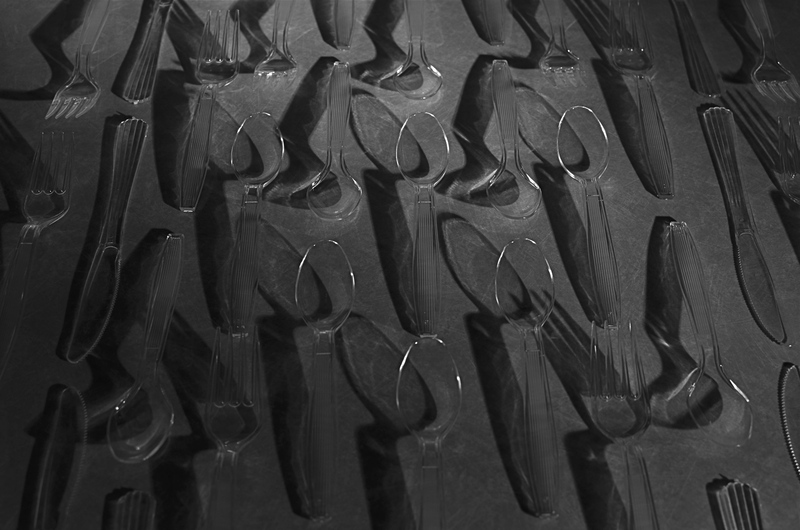 Plastic comes later, unless you’re talking about soda straws. The place is both museum and active business, stacking odd period collectibles chock-a-block into every nook as if the joint itself weren’t atmosphere enough. But hey, when you’re a grand old lady, you can wear a red hat and white gloves and waist-length pearls, and if you don’t like it, take a hike, thankyouverymuch. Three plays for a quarter, so you can eat “Tutti Fruiti” and listen to it, too. 1/40 sec., f/1.8, ISO 100, 35mm. Graced with a 35mm prime lens opened all the way to f/1.8 and great soft midday light from the store’s front window, I could preserve the warm tones of the counter area pretty much as they are. For the booths, a little slower shutter speed was needed, almost too long for a handheld shot, but delivering a more velvety feel overall. Both shots are mere recordings, in that I was not trying to “sculpt” or”render” anything. McAlpine’s is enough just as she comes. 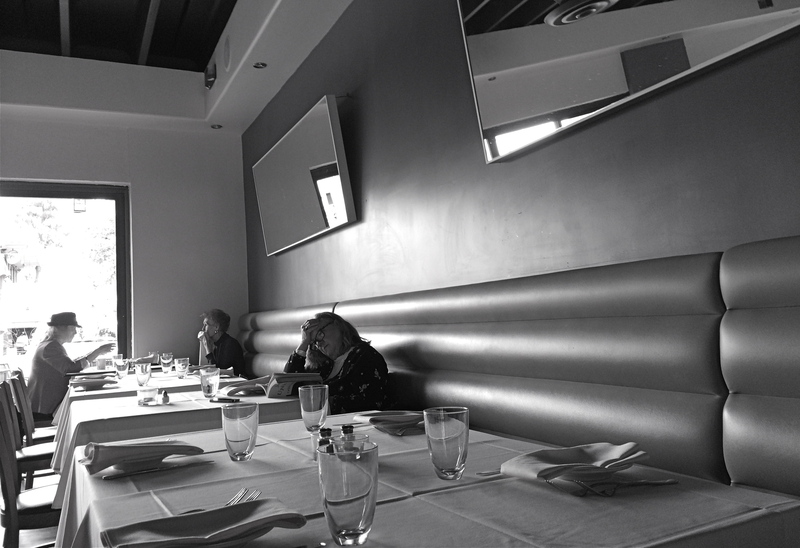 It was only a question of light management and largely leaving the place to tell its own story. What a treat when a subject comes to you in such a complete state that the picture nearly takes itself. Even better when the subject offers 75 flavors of ice cream. Especially when every other joint on the block is plain vanilla. 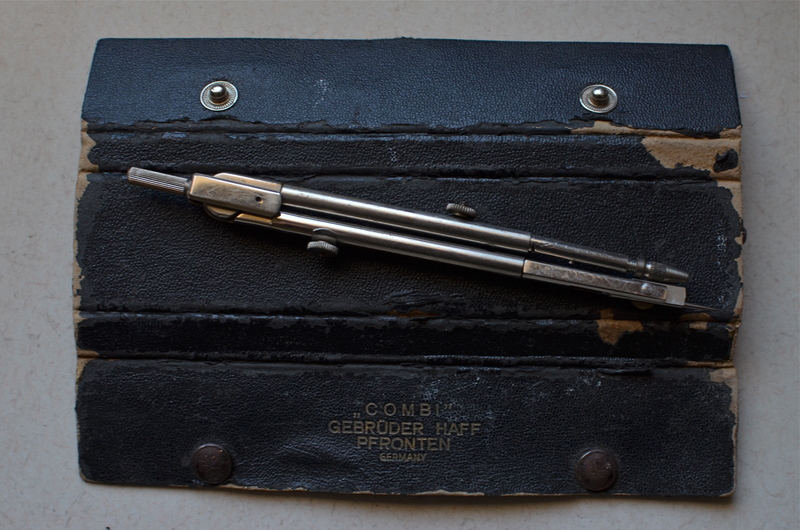 The Things They Carried: my wife’s father’s leather instrument case and compass. 1/60 sec., f/5.6, ISO 250, 35mm. WE LIVE IN AN AGE IN WHICH MOST OF OUR LIVES ARE EXHAUSTIVELY OVER-DOCUMENTED. We are, compared to our recent ancestors, photographically bitmapped from cradle to grave with a constellation of snaps that practically draw an outline around us and everything we do. Globally, we will take more photographs in two minutes today than the entire world took over the entire 19th century. That said, it’s amazing how few photos taken of, or by, us really look deeply into our souls, or whatever it is that animates us, makes us truly alive. 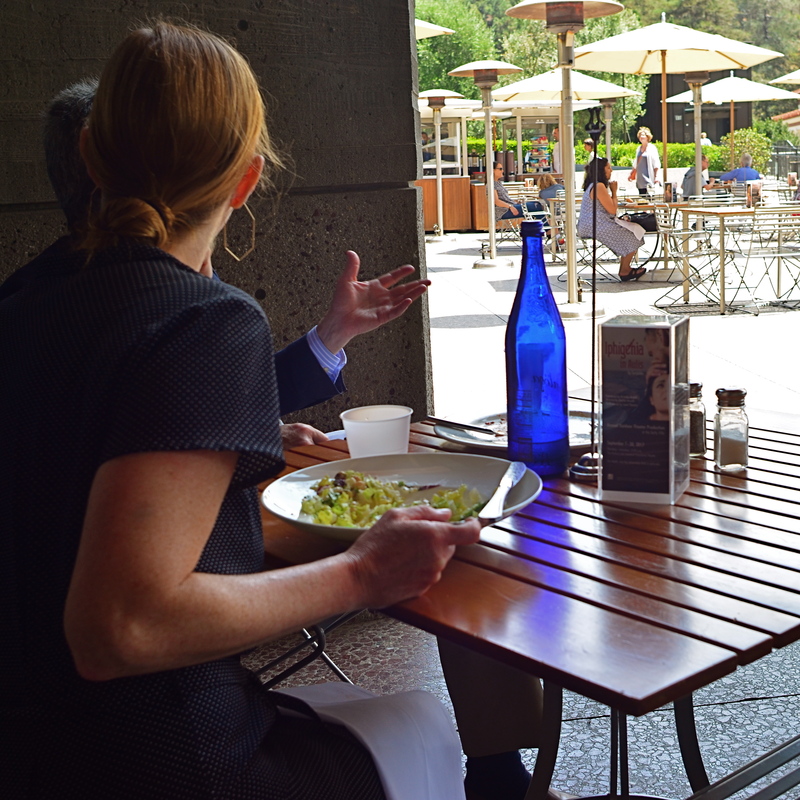 It’s not that there aren’t enough pictures of us being taken: it’s how inarticulate so many of them are. But go back just a generation or two, and observe the contrast. Far fewer images of most lives. And, with their increasing rarity or loss, more and more value attached to each and every one of those images that survives. Grandfather is gone, leaving only a handful of curled, cracked, and browning snapshots to mark his passing. But how rich the impact of those remaining pictures. The thirst for more, for a greatest number of clues to who this person was! How to increase or deepen his spirit without having him here? Explore the things he left behind. The tools he touched. 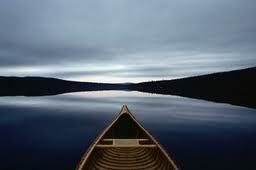 The places where he invested his spirit, his aura. The parts of the world that he deemed important. And I say: if you love someone, and have to let them go, use your camera to sniff around the found objects of their lives. It may not conjure them up like a holograph of Obi-Wan, but it will focus your thoughts about them in away which is nearly, well, visual. I fell in love with the worn little instrument case you see at the top of this page. It belonged to my wife’s father, a man whose life was cut short by illness, a life under-represented in photographs. He made his living with his wits and with his hands. The compass which was carried in this case was a tool of survival, something he used to make his living, to measure out his skill and art. It’s a treasure to have it around to look at, and it’s a privilege to be able to photograph its worn corners, its tattered grain, its rusted buttons. Time has allowed it to speak, louder than its owner ever can, and to act as his visual proxy. I’ve explored this theme in past posts, because I feel so strongly about the expressive power of things as emblems of lives. Long before our every action could be captured in an endless Facebook page of banal smartphone snaps, images had to work a lot harder, and say more. I’m not saying you should spend the next six months of your life raiding your closets for Ultimate Truth. I am saying you might be walking past a chunk of that Truth every day, and that it might just be worth framing up. The voyage and the vehicle: Sam Abell’s classic image of a canoe on Maine’s Allagash River, the cover image for his book, 1990’s Stay This Moment. THERE ARE PHOTOGRAPHERS THAT ARE SO AMAZINGLY ADVANCED that they make their images, wrought with love, ferocity, daring, and single-minded purpose, seem not merely visionary but inevitable. We see what they have brought us and exclaim, “of course”, as if theirs is the only way this message could possibly have been crafted, as if its truth is so self-evident that to have to formally recognize it is almost needless overkill. We confirm and validate that, for these pictures, the machine has truly been placed in the service of a soul, and one which writes fluently while we stumble with numb gestures. One such soul resides in the work of Sam Abell. If his name doesn’t roll off the top of your tongue alongside those of the obvious Jedi knights of photography, it’s because, for most of his forty-plus year career, he has kept a lower profile than Amelia Earhart, producing amazing work beneath the masthead of National Geographic magazine along with a host of other special commissions. When Sam came to to Geographic in 1967 as an intern, he already had four years of “hard” experience producing images for the University of Kentucky’s school of journalism to his credit, but the magazine’s photo editor, Robert Gilka, was hesitant to hire him, worried that his work was “too artistic”, too personal in its beauty to survive in the service of journalism. For Abell, it’s all about the patience. How long do you wait for the horse to wistfully glance over his shoulder? As long as it takes…..
With help, Sam Abell learned the balance for getting the facts for stories and getting the truth implied in their locales. 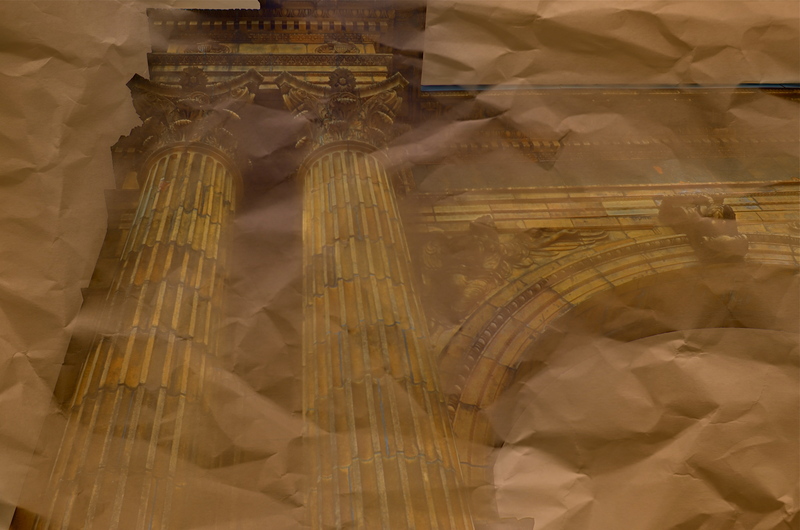 Even when those stories’ words shouted with urgency, Sam’s notes were always on the soft pedal. Their poignancy fades in and builds, rises to your attention and then rivets it in place. Writing in his 1990 collection Stay This Moment, Abell declares that the test of great pictures is that “they cannot be memorized”. Small wonder that he began, early in life, to pursue a career on the cello. Smaller wonder yet is that the patience of that instrument is “heard” in the music of his pictures. Always, a human context. 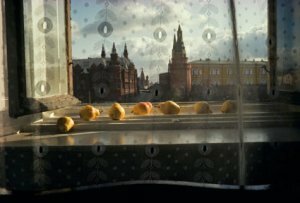 Sam Abell capture of the iconic buildings of the Kremlin, framed by ripening fruit and lace curtains. Even more muted than the images Sam creates is his technical approach to taking them. For much of his early career, he shot breathtaking landscapes with a simple 35mm camera, often a Leica reflex or rangefinder, mounted with standard or “normal” lenses ranging from 28 to 35mm, generating the least amount of distortion and rendering the most natural relationship of sizes and distances. For years, the most advanced tools in his bag were a sturdy Gitzmo tripod and the slowest, richest films he could find, frequently Kodachrome 25 and 64. The tripod delivered the stability needed to produce slow, sensual exposures; the ‘Chrome delivered texture and nuance beyond the power of hand-held shots. However, the most vital weapon in Abell’s arsenal is his astonishing patience, the wisdom, which flies in the face of traditional journalism photography, to wait for the story in a picture to slowly unfold, like the petals of a flower. Some of the best images Abell placed in National Geographic over the years took nearly a year to create. It happens when it happens, and once it does, God is it worth it. The number of printed collections of Sam’s work are few and far between, given his enormous output, but diligence rewards the curious. Among the most available of them is the collaboration undertaken with historian Steven Ambrose, Lewis & Clark: Voyage of Discovery ( 2002), for which Sam created images of the surviving sections of the legendary explorers’ trail to the Pacific; Amazonia (2010), an essay on the kind of delicate ecosystems that are vanishing from the earth; and Life of a Photograph (2008), an examination of how his most famous pictures were built, stage by stage. And, of course, there is the luxuriant (and hopelessly out-of-print) Stay This Moment (1990), the companion book to his mid-career exhibition at New York’s International Center for Photography. Buy it in a used book shop, grab it on e-Bay, scour your local library, but find this book. More importantly, find Sam’s work…any of it…and savor every detail. For copyright protection purposes, I have deliberately kept the illustrations in this article constrained to minimal resolutions. Find the real stuff, and see what Abell’s amazing sweep and scope can do at full-size. This blog is chiefly about how I, as a rank amateur, struggle with my own creative conundrums. But it is also about knowing what teachers to bend toward. Sam Abell, who literally teaches in mentor programs all over the country, has a powerful gift to impart. “What is right?”, he asked in 1990. “Simply put, it is any assignment in which the photographer has a significant emotional stake.” He also emphasized an important distinction (one of my favorites) in his remarks to a young photography student. Don’t say, he said, I took this picture. Say instead, I made this picture. 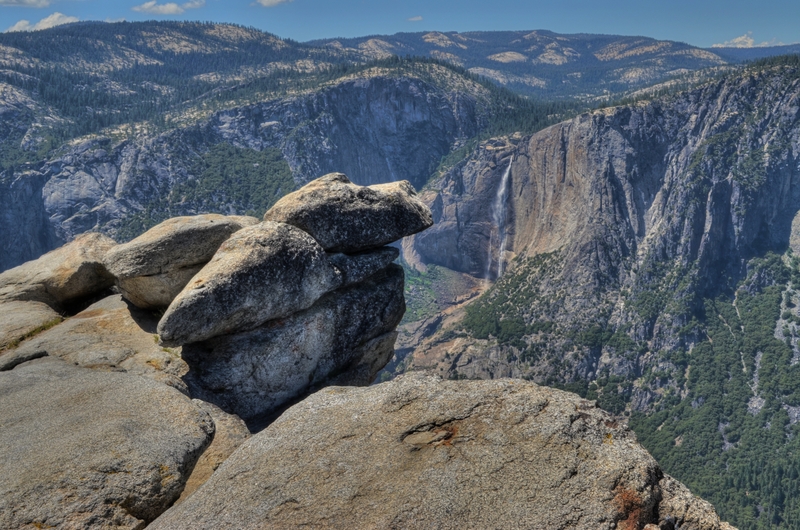 This is where it all began; the famous outcropping of stone atop Yosemite’s Glacier Point, where Sierra Club founder John Muir and President Theodore Roosevelt stood in 1903 to symbolize the beginning of the United States National Park system. 1/125 sec., f/14, ISO 100, 32mm. WE CAN ONLY GUESS, AS HE GAZED OUT UPON CANAAN, the long-promised homeland of the wander-weary Israelites, what Moses felt, especially given that he himself would be forbidden to set foot upon that sacred soil. Perhaps, in our recent history, something of a parallel can be drawn to the vista shown above, the aerie from which John Muir, the lanky, ascetic Scotsman who became the first champion of the Yosemite, peered into the vast wilderness he was sworn to protect. This is the view from atop Glacier Point, directly opposite Half-Dome and, in the farther distance, the majesty of Yosemite Falls. It is also one of the only places in the United States where you can literally stand on the spot where history took a new turn. Like Moses, Muir was a both a prophet and a protector, entranced by the stunning beauty of his adopted country and horrified at its vulnerability before the juggernaut of progress. Unlike Moses, he actually gained entry to his personal promised land, hiking its immense acreage, personally discovering many of its most amazing features and acting as correspondent to his fellow countrymen to apprise them of the great treasure lying unknown inside their borders. As the founder of the Sierra Club and the most profound poet laureate of the preservation movement (he favored that word over the later “conservation”), Muir’s first choice would probably have been to surround all of Yosemite with at least a mental fence, a barrier of conscience to prevent its plunder by profiteers. His second choice became fateful for us all…..to enlist the federal government as a guardian for his Eden, and to unleash the energy of that nation’s most intrepid crusader for the environment. John Muir was a veteran of nearly 35 years of preservationist skirmishes by the time he met President Theodore Roosevelt in 1903. 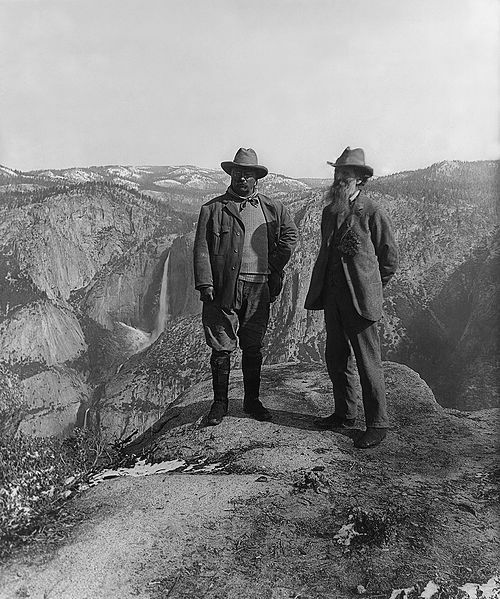 Muir, desperate for a way to protect Yosemite beyond the puny efforts of local and state governments, met TR in Oakland, California, and the pair traveled by train to Redmond before taking a stagecoach the rest of the way into Yosemite Valley. Muir used the travel time to implore the president to place Yellowstone under national protection, and Roosevelt, agreeing, asked his host to show him “the real Yosemite”. After heading out into the back country essentially alone and camping under the stars atop Glacier Point, the two awoke to new-fallen snow and a new alliance. “This is Bully!” Roosevelt and Muir atop Glacier Point, 1903. That alliance was captured in the shot at left, which shows nearly the same view of the Yosemite Valley as my image at the head of this article. Three years later, in 1906, Muir and the Sierra Club successfully added the valley and the Mariposa Grove (a massive forest of giant sequoias) to the overall Yosemite National Park acreage, and finally saw the entire area placed under federal protection. The United States National Park concept, unique in the entire world of the early 20th century, had been born, the American Moses leading the way to a greener, more perfect union.